Here is a great Stila Sale with free shipping with no minimum. The coupon code is good Tuesday 10/27, today, only and you need to enter the code 25OFF at checkout. This is a great time to stock up in your Stila favorites since they rarely g on sale. There are also many great items in the sale section that would make great stocking stuffers. You do not get the 25% off on sale items but you do get free shipping. There are great smudge stick and lip glaze duos that start at just $6! I am ordering a few for my teen. It is on sale for just $22 and marked down from $50. This would make a great gift! I love Halloween and getting great pictures of my kids in their costumes. I have found though on Halloween night it is very difficult to get a great picture since the kids are so excited to go trick or treating. We hurry home from school and the girls change into their costumes and are off before I can pull out my nice camera and get them posed. Also, it gets dark quickly which makes it harder to get that perfect picture. I am always sad that all I have to remember that Halloween costume is a few blurry dark photos. Here is a great chance to get that awesome picture, taken by someone else, and for FREE! How can you beat that!?! You’re invited to a Halloween Party! No tricks here, just treats. Portrait Innovations invites you to attend their FREE PORTRAIT EVENT, at your nearest studio on Monday, October 26th from 4-6pm. Make sure to come dressed in costume to receive a free 5×7 Print, 3 freeDigital Images, and of course FREE candy for kids in costume! There will be no sales or appointments during this event. Of course, there will be candy! What Halloween event would be complete without? And, for a little extra motivation for YOU, submit those darling costume portraits from the event in the Portrait Innovations Boo-tiful Costume Contest for a chance to win a $5,000 cash prize. That’ll make for a fantastic Halloween! Every Portrait Innovations Studio across the country is hosting the event. To find the studio closest to you, visit: http://www.portraitinnovations.com/Find-a-Studio. In the Metro Detroit area, there are locations in Brighton, Sterling Heights, Northville, and Rochester Hills. Can’t make it on the 26th? Don’t fret! Book a regular appointment, snap a few costume pics and you can still enter the contest. Planning to go? What will your littles be dressed up as this year? Disclosure: This post is sponsored by Portrait Innovations Studio. All thoughts and opinions are my own. Halloween is coming up soon and we have 40 Disney Halloween Costume Ideas for you. We broke them up into 2 sets of 20 in the pictures below. Each costume is under $30 at least when we wrote the post. Many of these Disney Halloween costumes are even under $20! Don’t forget that these costumes would be great for dress up too. Pricing does change so be sure to check before you purchase. Each costume is either from Amazon or Target and if you have Amazon Prime most of these will ship to you in just 2 days! Be sure to check out the other sellers on the right hand side of the page when you get to the Amazon costume page. Sometimes the price is less or includes the Prime shipping. Many of the Target costumes have the free store pick up option as well. Boden and Mini Boden is on Rue La La today. 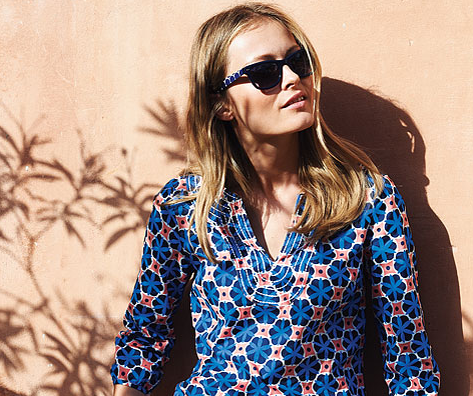 Ther is a voucher for $50 Voucher Toward Clothing, Accessories, & More at Boden Online for just $35 and one for $50 for $70 worth of clothing at Boden. This deal does not usually last long. I absolutely love Boden clothing for me and my girls. Be sure to go over and browse the Boden and Mini Boden site. What is great about the voucher is that you are able to stack a Mini Boden coupon code with the Rue La La voucher making for even better deals! Right now there is a 15% off Boden coupon and Mini Boden code that comes with FREE shipping. Here is how to get the best Boden deal. Within 24 hours you will receive a voucher via email confirming your purchase toward clothing, accessories, and more from Boden. Within 72 hours, you will receive a redemption email containing your unique shopping code. You use this voucher as a form of payment so you stack a coupon code with this deal. Once they email your voucher use with the Mini Boden coupon code or Boden coupon code that comes with FREE shipping! Sticking to a budget and saving can be hard. One thing though that can help is to systematically think about each purchase you make. This is especially true for large purchases including housing and vehicles. You also really want to apply this model to any purchase that you enter into a contract, for example, cable television or mobile phone service. Those monthly fees can really add up! The same theory though applies even when you are purchasing a shirt at the mall. Who hasn’t come home with a piece of clothing that seemed like a good purchase at the time and then it sat in your closet unworn. That is money down the drain. So how do you make smart purchases? For each purchase I make, I apply the wants vs. needs model and also consider if I am being over-sold. I recently purchased a new vehicle and I followed this model. I will walk you through my example so you can apply this model to your purchase decisions in the future. Needs – I need a vehicle to drive my children to school and make purchases for my business and home throughout the day. You might say that this is a want but my husband works over 45 minutes from our home and we have no public transportation. Also, school and shops are not within walking distance. Therefore, I am going to consider basic transportation a need. The need though would just be a used car that fits me and the girls and runs well. Wants – Luckily, we had enough room in our budget that we could afford to consider some wants in our purchasing decision. My wants included a vehicle that could hold 7 since sometimes I carpool and have more than my girls in the vehicle. Also, I hoped we could afford a backup camera since I worry about safety. My final want was heated seats. This seemed a bit extravagant to me but it does get super cold in Michigan and heated seats are amazing! Since these were all wants, when we shopped for a vehicle we priced out vehicles with and without these options. That way we could determine what fit in our budget. Avoid the Oversell – The vehicle options in my wants list were often bundled with a bunch of different options. These bundles made a HUGE difference in price to the total vehicle cost. By going with one vehicle brand vs another, I was able to get my wants without a bunch of extras and that ended up saving us almost $5000 on the purchase price. I even got my heated seats. Hurray! Do you consider wants vs. needs and avoiding the oversell when you make a purchase? You will be surprised how just taking these steps can help you meet your budget. The funny video below for the latot stroller helps show just have easy it is to get sucked into the oversell. I must admit there were some baby items that I purchased that in hindsight were more than we needed. Have you looked at the cost of your mobile phone service lately? With Total Wireless you get everything you need and nothing you don’t on America’s largest and most reliable network. They require no contracts and no credit checks. For $35 per month, Total Wireless gives you unlimited Talk and Text and 2.5 GB of data on America’s largest and most reliable network – no contract required. And, for just $10 you can purchase 1.5 GB of shared Carryover™ Add-On data – unused data does not expire with active service. For families that have additional needs for devices, lines and data, Total Wireless is one of the first prepaid, no contract shared family data plans in the market. Get two-line plans with 5.0 GB of shared data across devices for $60/month, it’s ideal for couples and families. How does that compare to your current service? Be sure to multiply the monthly savings by 12 to see how much you could save annually. Total Wireless phones and service plans are available only at Walmart and can be found at over 3,000 participating Walmart retailers nationwide. An attendee at one of my classes mentioned what a great deal this is. I have also ordered myself and love it. There is still time to put in your order. It is a great way to get hormone free meat at a stockpile price! Locations will sell out so if you are interested be sure to put in your order soon. In How to Save 50% off on your groceries in under an Hour a Week, I talk about how important it is to pick up meat at low prices and stockpile. That way you are not at the mercy of grocery stores cycles. Here is an amazing deal from Zaycon food. You can get boneless, skinless chicken breast for just $1.89/lb. This is a stock-up price! What makes this deal even better is that this chicken is 100% natural with no added hormones, additives or artificial ingredients. I am buying this again because the quality is exceptional and this is a stock up price for even lesser quality meat. It does come in bulk but you can then freeze it in meal size portions. Forty pounds seem like a lot of meat and it is but after prepping and freezing in my family’s portion sizes. I could fit all 40 pounds on just two shelves in my side by side freezer. I loved that I was stocked for quite a few months and I didn’t have to worry about finding the best deal on chicken at the grocery store. The pick up dates vary by location but they are available across the whole country! Check out Zaycon Foods to find a location near you. On the day of pick-up, head to the location at the specified time with your printed receipt to pick up your chicken. Zaycon Foods has sales in most of the country. Just check out the Zaycon foods website to find out if and when they’re coming to your area. Plus once you sign up over at Zaycon, they will email you once a sale is coming to your area so you don’t miss out. There are locations all across the United States. Does 40 pounds of chicken seem like to much for you? You can always split with a friend but really it doesn’t take up all the much space once you package it in meal sized portions. I was suprised by how little room it took up. We do not have an extra freezer and I was able to fit all 40 pounds in just two baskets in my side by side freezer! Did you know that families with school age children will spend an average of $630.36 on school supplies and apparel in 2015? Here is some great information and back to school savings tips to help you save time and some cash. I am all about saving money but sometimes I am will to spend a bit more if it saves me time. 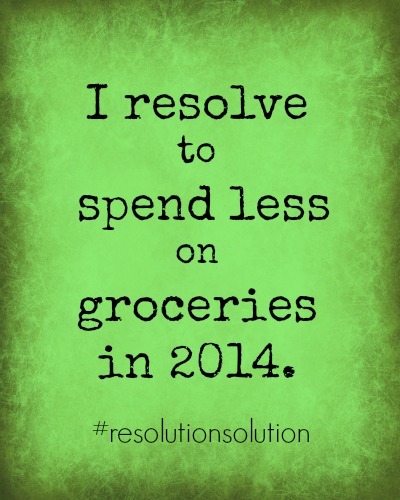 Saving money and eating well are on many of your lists for the upcoming year. Here are some great freebies and coupons that can help you! There are no strings attached and they often will send you new products to try out! I love both of these and have been signed up for these newsletters for over 3 years. This is great source of coupons and recipes! Looking to learn more ways to save money at the grocery store? Be sure to check out this article about how to save 50% off your groceries in under an hour a week! Disclosure: This Post is sponsored by General Mills. Hosting a Valentine’s Day party for children can be a load of fun and accomplished inexpensively with a little preparation and planning. Jennifer Carver, of Spaceships and Laser Beams, is here sharing her tips for hosting a budget friendly celebration your children will love (we think you’ll love her money saving ideas for invitations, decorations, treats and activities too!)! Tip #1: Handcraft your invitations. Instead of buying expensive store bought, boxed invitations, create your own! Using basic craft materials and hand cut paper hearts, add all of the essential party details including date, time, and location and whether guests should bring Valentines to pass out or a treat to share. Another fun idea is to inflate heart shaped balloons with helium and tie the party details to the balloon with pink or red twine. Hand deliver the invitations for extra excitement (and to save money on postage and envelopes). Not crafty? There are lots of free Valentine’s printables boys and girls will love. Tip #2: Invite guests to bring a Valentine’s Day treat to add to your dessert spread. Whether you are going all out on a full dessert table or just setting up a small display of tried and true favorites, inviting guests to RSVP with a treat they’d like to bring will help you provide a sweet variety, save on out-of-pocket costs and reduce your party prep time. Plus, most guests will bring something that they personally like, which means satisfaction guaranteed! Win-win! One great activity and treat is to decorate heart shaped cookies. Here is a can’t miss no spread sugar cookie recipe and tips for cookie decorating with kids. Tip #3: Choose no fuss decorations from your party and entertaining stash and purchase remaining items at after-Christmas clearance sales or dollar stores. With many holidays throughout the year that traditionally incorporate red and white (4th of July and Christmas quickly come to mind), chances are you already have a few décor staples on hand that you can reuse and repurpose. Gather up linens (tablecloths, runners and napkins), serving trays, platters and cake stands and leftover tableware such as paper plates, napkins, cups and utensils. All of these items will make perfect additions to your décor! If you plan ahead you can take advantage of after-Christmas sales to bulk up your décor and party essentials. Many basic red and white items can be found for practically nothing! Even solid color holiday wrapping paper or something with stripes and dots could be used for a table runner, for making disposable place mats, to line trays or spruce up water bottles. Plain packaging items on clearance can be used to create party favors or to package sugar cookies if your party includes a sugar cookie decorating station. Additional items can be purchased from dollar stores. Many dollar stores sell cute red and pink plastic heart embellished glasses, red and pink plates, cutlery and even small heart confetti. Add heart shaped helium balloons, some DIY tissue tassel garland, a love banner cut from cardstock and you are set! Tip #4: Plan a few simple games and crafts geared towards Valentine’s Day. Keep costs down by focusing on the sharing of Valentines. Guests can be invited to bring Valentines premade, or you can provide simple card making materials at the party. Valentine mail bags or boxes can also be made as a simple craft. Other party games can include classic party games twisted to match the party theme. “Cupid Says” or “Pin the Arrow on Cupid” are easy adaptations of crowd favorites. Tip #5: Hand Out Simple Favors – These cute Magical Pony Valentine favors are super cute and so inexpensive. This EOS Valentine card (pictured above) would make a great favor too! These five budget friendly tips will help you host a Valentine’s Day party the kids will be smiling about for a long time! Plus they are so easy that you can throw together in no time at all! This class is cancelled due to the snowstorm. I will update you when it is rescheduled. Does getting food on the table stress you out? Then be sure to attend our upcoming Meal Planning class. This class will help you save time and money plus reduce the stress of the dinner preparation. This is the last class I will be teaching for awhile so don’t miss out. The class will walk you through the different phases of meal planning and teach you the ins and outs of 2 different “schools of thought,” so that you can come up with a meal planning plan that works for you. Get practical help with how to make the most of the time you spend in the kitchen, making healthy and delicious meals in a fraction of the time! You will receive a pamphlet to take lots of valuable notes during the workshop. So come prepared to learn, discuss and connect with others who are excited about saving money and time in the kitchen too! Following the workshop, attendees will leave with a better understanding of all the different ways to make a meal plan. All the tips and tricks to making meal planning successful, along with cooking strategies and shortcuts to help you spend less time in the kitchen, while still making fabulous meals for your family. This class is sponsored by the library and free to all attendees. You do not need to be a Clarkston resident to attend. There are so many ways you can save money at Target. They offer a number of store specific coupons, accept manufacturer coupons and price match. Here’s your guide to How to Save at Target. Investigate your viewing habits – Entertainment begins and ends with the television for most people. Whether you view your favorite shows and movies online or through the Cable, we all partake of this type of entertainment in some format. How do you watch your shows? If you are paying for the one million channel system and only watch five or ten, you are not making the most of your entertainment dollars. Cut back on your channels and you will never even realize you did in most cases. Also don’t be afraid to switch or renegotiate services to get a better deal. When you call to renegotiate your rate, be sure to ask for the cancellation department. When you say you are canceling your service, they will almost always offer you a better deal. Most often the new rate will be for a limited time so be sure to mark down that date on your calendar and call to renegotiate again. This is a pain I know but I often end up saving almost $100 a month. Consider an online experience – The beauty of watching your shows online and ditching the television is one way to cut your entertainment budget severely. All you have to do is investigate Netflix, Roku , Apple TV , Google Chromecast and various other avenues of online viewing. You can generally find anything you want to watch…and watch it on your own schedule. Add in the fact that it is far cheaper than Cable and you have a clear way to save cash. Consider free museums and parks – Pretty much every city in America offers up free entertainment in the form of museums and parks. Spend some time enjoying these with your family and bring along a picnic lunch. You don’t have to spend a fortune to have a wonderful time at one of these wonderful places. Buy seasonal packages – For ball games and various other entertainment venues, season packages will save you a ton of money. If you are a regular at the opera, for example. you may as well go ahead and spend the cash to buy season passes. At least you will get the best possible rate by doing so. We do this with a season ski pass. We also buy it early to get the cheapest price all year. The early pass cost equals just 4 days of skiing so after those 4 days it is like we are skiing for free! Use coupons or vouchers – You can often find vouchers for restaurants and other entertainment activities at daily deal sites like Groupon and Living Social. You can find great coupons for restaurants from the entertainment book. I buy this coupon book each year and always more than save the money it costs. I also love to follow restaurants on social media. They will often offer up special coupons for their fans. Learn to entertain at home – Home is one of the best places to have a good time and there are countless ways to change it up. Have a family game night, bring the friends over for a cookout, hold a pot luck, or simply gather and play board games or just talk. Don’t be afraid to ask people to bring a dish. Most people are so happy to have a chance to get together that they are more than happy to bring a dish. Find some tips here to save on the food you purchase for the get together. The last thing you should have to do is spend cash when you are trying to save on entertainment. Make your own fun that is free! Saving money on entertainment is really about paying attention to what you truly like to do. Generally speaking, we all have things that we simply love to do. Identify those things and invest your entertainment dollars in them. This way you get the entertainment fun that means the most, while trimming those things that matter little. Don’t be afraid to make drastic cuts, because you will find other less expensive ways to have a good time. Bonus Cash For New Capital One Accounts – Up to $200! Want some extra cash for one of your savings goals? Be sure to check out these two offers from Capital One! They only come around twice a year and they are a great way to save and get cash back! One great way to save money is to put it in an account that is dedicated to a certain saving goal. An Capital One account is a great place to do this especially since right now they are offering HUGE bonus for new sign ups! You can create an account for each member of your family. I already have one account where we saved for kitchen remodel and our emergency fund but want to open an account for each girl so they can start saving too. This bonus cash will be a nice start for them. This would also be a great place to put aside money for a vacation or other savings goals. You can get a FREE $125 when you open a checking account and FREE $75 when you open a Capital One Savings Account!! Or you could do both and get $200!!! There is a minimum deposit on the savings account but NO minimum deposit for the checking account! Remember you have UNTIL JULY 3 to to sign up for these offers, so be sure to sign up before then to get your free money. Also, once you create your checking account you can refer two friends and get an EXTRA $100 BONUS!!! I am offering an upcoming Metro Detroit grocery savings and beginning coupon class tomorrow night! Are you looking to learn the basics of couponing and other easy ways to save at the grocery store? How would you like to save 50% or more on your weekly grocery bill? Don’t you have other ways that you would like to spend that money? I know I do. This upcoming class is sponsored by a local metro Detroit library and you can attend for FREE! This is your chance to learn how to save at the grocery store with a Metro Detroit Coupon & Grocery Savings Class. The regular price is $10! My workshop teaches attendees simple, savvy tips and tricks to save money at the grocery store by pre-planning meals and purchases and using coupons to score savings of up to 50% on grocery bills. Saving on your grocery bill is three-fold, and I believe that by utilizing the tips below, plus many more that I teach in my workshop you can save more than half on your next grocery bill. Most people don’t realize that these 3 key pieces together can save them loads at the grocery store. Shopping Smarts — Outsmart yourself and outsmart the marketer by sticking to “rules” like don’t fall for the “end cap” trick, and resist the delicious temptations in the check-out line, celebrity magazines included! Couponing — Use everydaysavvy.com and other local websites I will tell you about to help you match what coupons are currently available with the products that are on sale to get rock bottom prices. You will receive a workbook to take home with you too! I will show you that by making simple changes in your buying habits you can save so much money! You don’t have to spend hours and hours cutting coupons in order to save. This class is sponsored by the library and free to all attendees. You do not need to be a Canton resident to attend. You do not need to sign up ahead of time just come and learn how to save. If you are unable to attend be sure to read this easy ways to save on groceries article. If you live elsewhere in the country, be sure to check out this same great class being offered across the nation. New classes are being added all the time as well. I am in the process of scheduling more classes throughout the Metro Detroit area but need to know the best place to plan them. To help me, please fill out this quick and easy survey. I also have a special limited time offer for groups that contact me to use this class as a great fundraiser. All your group has to do is provide the space and promote the class to those you know and I will teach the class, provide amazing workbooks, and help people save money. Your group will receive the profits from the class entrance fee! This provides a great value to the attendees and is an easy money maker for your group! Be sure to fill out the quick and easy survey to let me know your group’s interest. 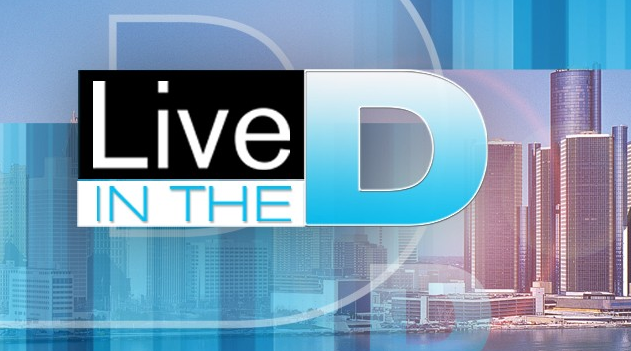 I will be appearing on local 4 WDIV Live in The D today! A few weeks ago, I explained some of the ways you can save on groceries plus we announced the Local 4 Grocery Saving Challenge. Today we are introducing the volunteers who will put these savings strategies to work for their families. Join the Everyday Savvy Grocery Savings Challenge Facebook Group Here. You can invite your friends to join too! Be sure to read a this Easy Ways to Save on Groceries Article to get you started. If you are local, I have a Metro Detroit Grocery Savings/ Intro to Couponing class coming up soon that is free to attend. This page with savings and recipe resources will help too! I look forward to you joining and everyone learning how easy it can be to save on groceries. Today is the last video chat. Be sure to join us. Plus you can watch any you missed! I know many of you are not local and are unable to attend my Metro Detroit Grocery Savings and Coupon Classes. That is why I will be offering a new online video discussions series that will help you learn the tips and tricks to saving at the grocery store. Plus I even have some expert cohosts that will be giving their expertise as well. In weeks 1 and 2, I will be joined by my friend Kristie from Saving Dollars and Sense and in weeks 3 and 4, I will be joined by my friend Laura at Beltway Bargain Mom. These ladies know their stuff and we will be giving information that can reduce your grocery bill by up to 50%!!! 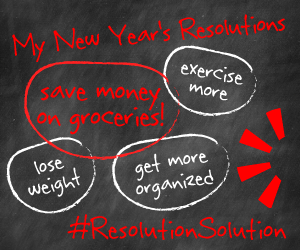 If one of your New Year’s Resolutions is to save some money in 2014, you will want to attend! We will be discussing the Favado Grocery Shopping & Savings App in all the sessions, so be sure to download it today! I also am giving away a $50 Visa Gift Card sponsored by Favado. Details on how to enter coming up soon. The first discussion is occurred on January 9 at 1:00 pm EST. You can view it here on the new Bargain Shopper Mom live training page or over on the Bargain Shopper Mom Youtube page. If you can not attend in person at the time of the discussion, they all will be taped and you can view them anytime View at Bargain Shopper Mom Youtube page after the discussion has finished. The first week, we’ll be talking mostly about the little habits you can change while shopping that can make a big difference in your grocery spending…such as not buying the magazines off the rack at the checkout, writing a grocery list and sticking to it while shopping, as well as checking unit prices and sale expiration dates. Favado helps by allowing you to have a shopping list in the palm of your hand that you won’t forget at home! Here is a link to the week one video. Grocery stores and manufacturers work hard to push out their best sale prices to you on a weekly basis through their store circulars. If you follow along closely, you’ll notice that most products operate on an 8-12 week sales cycle. You’ll also find that “product families” all go on sale at the same time, for example all the P&G products will be discounted the same weeks, and will return to their regular prices for a few weeks, then go back on sale together. Favado Helps by showing you when your favorite products go on sale, so that you can purchase them when they are on sale and not have to pay full price in between sales cycles. Over time, you’ll learn how much to purchase to last you until the next sale. The deep 50-70% savings that you hear talked about frequently occur when you combine a coupon with an already discounted product for “double the discount.” For example if toothpaste is on sale for $1 and you have a $.75 off coupon, you’ll get that toothpaste for just $.25, as opposed to its $2.49 regular price. Favado Helps by doing all the hard work for you and putting the best sale prices with matching available coupons in a nice, organized list. Favado makes it easy to find these discounts and save big on groceries. Making a meal plan based on what’s on sale in your local grocery stores can help you cut your grocery bill by 20-30% alone. Matching your meals with the sales is a simple, scissorless way to save each week at the grocery store. Favado helps by allowing you to search for ingredients that are on sale for the meals you want to make each week. Want to make a slow cooker meal that calls for boneless skinless chicken thighs or beef roast? Favado can tell you which store has those ingredients on sale each week. If you have some specific questions, be sure to leave them in the comments and we will do our best to address them all in the videos. 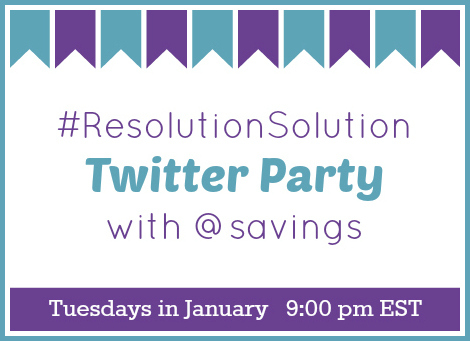 I hope you can join us and getting started right this year on the path to saving money and living well! It is the new year and I know you all want to save money! One easy way to do this is with Favado. This is my favorite money saving app. It makes saving at the grocery store so easy since most of the work is done for you. Another great thing about the app is that it is FREE! You can find out all the deals at your local grocery stores and drug stores. Plus it will even tell you if there is a coupon that makes the deals even better. Be sure to register and download Favado today! I also am hosting video chats around each theme so you can learn even more! We will be answering the questions you ask on this post during the live chats!!! The first week, we’ll be talking mostly about the little habits you can change while shopping that can make a big difference in your grocery spending…such as not buying the magazines off the rack at the checkout, writing a grocery list and sticking to it while shopping, as well as checking unit prices and sale expiration dates. Here is a link to the week one video. Learn how you can save! Grocery stores and manufacturers work hard to push out their best sale prices to you on a weekly basis through their store circulars. If you follow along closely, you’ll notice that most products operate on an 8-12 week sales cycle. You’ll also find that “product families” all go on sale at the same time, for example all the P&G products will be discounted the same weeks, and will return to their regular prices for a few weeks, then go back on sale together. Favado Helps by…showing you when your favorite products go on sale, so that you can purchase them when they are on sale and not have to pay full price in between sales cycles. Over time, you’ll learn how much to purchase to last you until the next sale. The deep 50-70% savings that you hear talked about frequently occur when you combine a coupon with an already discounted product for “double the discount.” For example if toothpaste is on sale for $1 and you have a $.75 off coupon, you’ll get that toothpaste for just $.25, as opposed to its $2.49 regular price. Favado Helps by…doing all the hard work for you and putting the best sale prices with matching available coupons in a nice, organized list. 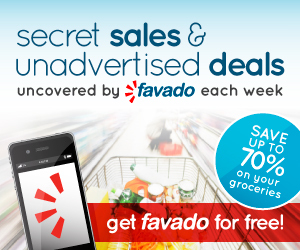 Favado makes it easy to find these discounts and save big on groceries. Making a meal plan based on what’s on sale in your local grocery stores can help you cut your grocery bill by 20-30% alone. Matching your meals with the sales is a simple, scissorless way to save each week at the grocery store. Favado Helps by…allowing you to search for ingredients that are on sale for the meals you want to make each week. Want to make a slow cooker meal that calls for boneless skinless chicken thighs or beef roast? Favado can tell you which store has those ingredients on sale each week. To add to the fun, join in the Favado Twitter parties! You can RSVP for tonight’s party here! We’d love for you to join in the fun. There will be $300 in grocery store gift cards to give away each week! Each Twitter party will match the theme for the week, as outlined above. Reader Giveaway: One lucky Bargain Shopper Mom reader will win a $50 VISA Gift Card courtesy of Favado. To enter, just complete the entry form below by 11:59pm ET on 1/20/14. Good luck! Recently I was invited to the Aldi headquarters to learn more about the company, participate in a blind taste test of Aldi products vs national brands and sample their holiday recipes and products. 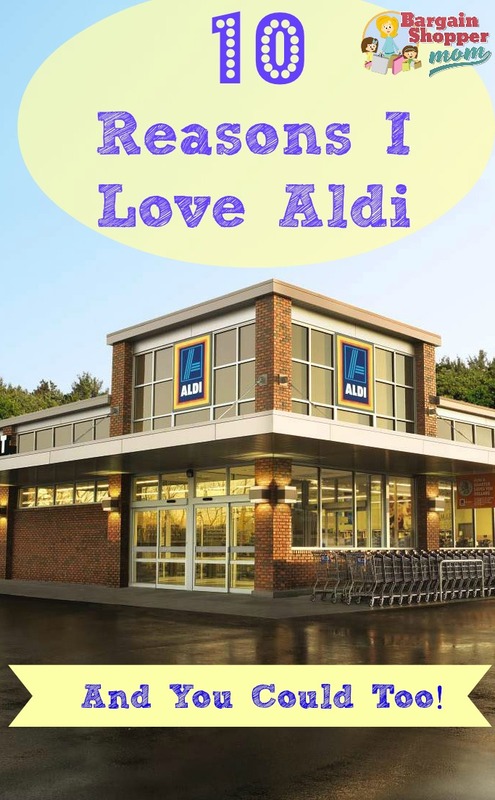 I was already an Aldi shopper so I was excited go and learn more about the company and their products. Aldi shopping is perfect for me because it neatly fits with the mission of this website which is to help you all save money and live well. Enroll your eligible American Express® Card to get $10 back one time when your spend $10 or more at a qualifying small business location on November 30th. Enrollment is limited so act early before enrollments run out. Corporate and prepaid cards are not eligible. This works at all local non franchised small businesses that accept American Express. It include boutiques, stores, bakeries and restaurants! You can go out to eat on November 30th and when you pay with your American Express you get a $10 credit! The movie theater near me is also participating that is a free movie ticket! All you have to do is use your enrolled Card to spend $10 or more in a single, in-store transaction at a qualifying small business location on Saturday, November 30, 2013, you will receive a one-time $10 statement credit from American Express within 8 weeks. 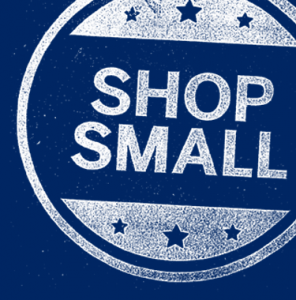 Visit ShopSmall.com for information about qualifying small business locations where you can Shop Small® on November 30, 2013. Additionally, many small businesses also offer special discounts to their customers that day. In my Holiday Savings Class, I have been suggesting that people call their favorite local small business and see whether they will have special offers. Plus everyone who attends will receive a FREE Homemade Christmas gifts ebook with directions on how to make tons of wonderful homemade presents! This class is designed for shoppers of all ages, online shoppers, and in-store shoppers. There are three upcoming classes. This class is sponsored by the library and free to all attendees. You do not need to be a Troy resident to attend. This class is sponsored by the library and free to all attendees. You do not need to be a Farmington resident to attend. This class is sponsored by the library and free to all attendees. You do not need to be a Canton resident to attend. Amazon has already started lots of lightning deals for the holidays. Many of their prices will match or be better than the Black Friday prices in store. I suggest that you check out and bookmark the Lightning Deals Page now and check it out each morning to see if any items are on your holiday gift lists. You can select the category on the top right hand of the lightning deals. Some of the most popular deals will sell out in under a minute. My suggestion is to be at your computer right when the Lightning Deal starts and immediately put it in your cart. You then have 15 minutes to check out. During that time, you can do some price checking to see if you really want to buy the deal. DO NOT complete that price checking price first because when you come back you might not be able to add the item to your cart. If you add it to your cart and find out the price is not that great just don’t check out. Last year many people lost out on great lightning deals because they did not immediately add the deal to their cart. If you are not a member of Amazon Prime, this is a great time to sign up for Amazon Prime for FREE! You can try it out for FREE for 30 days which will enable you to get FREE Two-Day Shipping with no minimum order size on millions of items. This is great because otherwise you would have to pay for shipping or get to the $35 minimum for FREE super saver shipping. This free offer is only good for 30 days and after that you either need to cancel or pay for the yearly membership. I personal love it and think it is well worth the cost. Here are a few links that show deals that will show you specific sales. Once the calendars come out for the the movie and books deals I will add these here too! These links are hard to find on Amazon so you may want to bookmark them. Looks like this was on the air again this morning. Here are some great resources. If you were not able to catch the news segment live. Here is a link to my TV spot on how to save on Halloween costumes. I am pleased to announce that I was chosen as one of Live in the D’s new money saving experts. I will be sharing my money saving tips once a month on Live In the D. This live show focuses on local and national news and explores the intersections of culture, entertainment and lifestyle, and how it affects life in Metro Detroit. You can view it on Channel 4 in Metro Detroit from 11:00 a.m. to 12:00 a.m. each weekday. I will on live today speaking about how to save on Halloween costumes. The basics of these tips can be found here. You can find coupons for Spirit Halloween, Party City and lots of coupons for Halloween candy too! I share many more money saving tips and deals each day. So be sure to sign up for my FREE daily e-mail newsletter. This way all the best money saving tips and deals will come right to your inbox. You can also follow Bargain Shopper Mom on facebook. Facebook doesn’t show you everything though unless you interact with the page so be sure to leave a comment once and awhile or like/share a status update. Looking to save on groceries? Be sure to check out the best deals at the grocery store each week. Looking to support local Detroit entrepreneurs? Be sure to check out this boutique children’s clothing brand designed and manufactured right here in Metro Detroit! I am so excited to share this new Grocery Shopping Savings App with you. I know many of you think it is difficult to save at the grocery store but this new app does all the work for you. It works at stores all across the United States. You can find your regional grocery store in the app as well as national chains. It is easy to check which stores in your area have the best price on different items and it will even let you know if there is a coupon that matches up with the sale. Did I mention that the app is FREE! By using the app you can save over $1000 a year on groceries easily with by buying items on sale and never paying full price. If you stack coupon saving on top these sales you will save even more. This video explains the basics. Sometimes, two or more stores have the same product on sale at the same time. With Favado, you can compare prices on specific items across multiple stores at one time, so you get the best price. Save time by building and sharing shopping lists for the week. You don’t have to look through the circulars anymore; just open the app and find all the sales in one place. Industry experts pick their favorite “top deals” for the week to help shoppers save even more. Save your favorite products and brands to your “Faves” list to see stores offering sales on your preferred items. Don’t you hate missing a sale? Never miss one again! Favado can send you push notifications when a new sale starts at stores you select. Have you ever purchased something, but later realized you had a coupon for it? Favado will let you know when additional coupons and savings are available, and where you can find them. I honestly can not say enough good things about this Grocery Shopping Saving App. It will revolutionize the way you shop for food. Have a little time while you are waiting to pick up the kids? Grab your smart phone and start making your grocery list. Need chicken for dinner but want to pay the best price? Use the compare feature to find chicken on sale near you. The amount of data available at your fingertips is amazing. Plus if you plan your shopping trips you can save so much money. Wouldn’t you rather spend the money on a vacation, your kid’s education, or saving for retirement. How can you get this great Grocery Shopping Savings App for FREE? Be sure to complete the form with your user name and password. Use the App Store or Google Play to download Favado to your iOS or Android device. Start saving big money at the grocery store! If you are local, be sure to check out the Metro Detroit Grocery Weekly Sales and coupon match-ups here. Every wanted to attend one of my Grocery Savings Classes but live too far away or missed out on recent classes? Well here is your chance to attend the exact same class for FREE online. 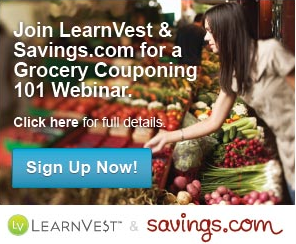 Join Savings.com & LearnVest for a live webinar on this Thursday, September 26th at 8 p.m. EST. Learn how to save up to 50% off your weekly groceries and how to put those savings to work! Meal Planning Made Simple: Get practical tips for planning out your menu and save the most money while feeding your family. The class is hosted by LearnVest & Savings.com and the webinar will be led by: a LearnVest financial expert and Savings.com DealPros, Lynette Rice of CleverlySimple.com and Laura Harders of BeltwayBargainMom.com. I personally know both of these ladies and they know their stuff. You will not be disappointed. By registering for the webinar, you will be automatically enrolled in LearnVest’s program and receive access to LearnVest tools. You will answer just 4 basic questions and then you can register for the class. Sign up For the FREE Grocery Savings Webinar Class Today!